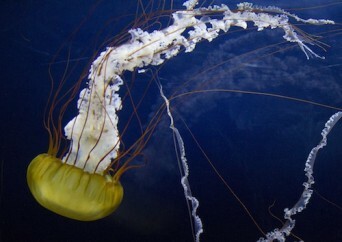 What is more fascinating than the shimmering colors and mesmerizing creatures of the world beneath the water? 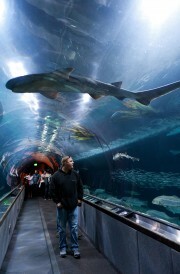 San Francisco’s Aquarium of the Bay, accredited by the Association of Zoos and Aquariums (AZA) for its high quality of animal management and care, is home to more than 200,000 live creatures from sharks to eels, rays to jellies. Partnered with nonprofit sister organization The Bay Institute, the aquarium aims to educate, inspire, protect and restore the San Francisco Bay and its watershed, from the mountains to the sea. Composed of a varied series of experiences and exhibits, Aquarium of the Bay offers a fascinating bay immersion. Visitors can start at “Discover the Bay” where they are introduced to local marine life and Bay Area ecosystems while getting a peek at some of the bay’s most vibrant creatures. Next, visitors move to the iconic “Under The Bay” tunnel, surrounded by over 700,000 gallons of bay water. From a rainbow of rockfish to giant octopi, the awe-inspiring journey through the tunnel is like gliding deep below the surface of the Bay itself. For an even more up close and personal interaction, “Touch the Bay” allows visitors to meet tide pool invertebrates, leopard sharks and bat rays as well as snakes, turtles and tortoises. The aquarium also provides educational tours that include observing shark, ray, skate and fish feedings as well as participating in hands-on pH and oxygen testing. With their strong emphasis on conservation and education, the aquarium even provides teachers with free lesson plans and workshops to to bolster their knowledge of the biology and ecology of the Bay Area. Situated next to the world famous PIER 39 and historic Fisherman’s Wharf, an afternoon at the aquarium is an exciting way to learn about local marine life and explore the prized treasure that is the San Francisco Bay. Posted January 28th, 2014 & filed under Travel.